SG-1’s big operation to move a civilization to a planet that can support them seems to be success, until it isn’t when an alien spacecraft starts terraforming the new home to repopulate a dead civilization. Since the recent dropped off civilization isn’t desperate to leave and the alien ship isn’t stopping, SG-1 is left in a serious quandary. While Daniel tries to reason with the construct running the terraforming ship, the rest of the team prep to take down the alien ship. The solution to this problem is actually a simpler one than you might think: find the homeworld of the recent refugees. –It’s probably a good thing Daniel and Lotan put their heads together and realized that Lotan’s ship actually passed by the Enkaran homeworld earlier but it wasn’t quite suitable for terraforming. –The Enkaran eyes are creepy as hell. –As this is the second Canadian filmed show I’ve recapped on this site, we’re getting some overlap as Dr. Hamilton from Smallville pops up as one of the Enkarans. –O’Neill tries to blow up the ship with a Naquadah bomb, and–oops, it gets beamed into the sky to explode. So that didn’t work. 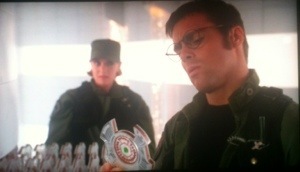 SG-1 seems to be unaware of who they are, while working in some underground facility that is apparently buried under ice. As they start to slowly remember who they were, they realize there’s something else going on. That happens to be they are, like many people in the facility, unaware that they are providing power for a thriving civilization above them who uses them for slave labor. You just know SG-1 won’t stand for that. –So, the head of this controlling minority decided to mindwipe SG-1, claim they died to Hammond, so he could get extra workers? That seems like a bad plan at best, considering how it seems to fail when mind wiping Teal’c seems to not take. –Surprise, SG-1 decide to expose the population to the fact they have been lied to about what they’ve been doing or who’ve they’ve been doing it for all this time. No need to feel guilty about that, guys, even though it looks like they take off before I’m assuming the eventual revolution jumps off. 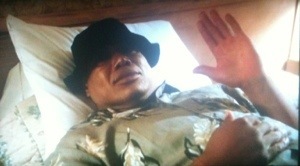 –Teal’c takes his bedside time midway through the episode to regain his memory, which still, why bother to continue to mind wipe someone who clearly is not forgetting. –Carter gets a haircut this episode to a more pixie hairdo as opposed to the long hair of this season so far. A phone call regarding knowledge of the Stargate program sends O’Neill to investigate a paranoid conspiracy nut named Martin Lloyd. Martin claims he is not some nut, but an actual alien who doesn’t recall how he knows about the Stargate, but it seems he knows a lot about the gates. The rest of the team investigate Martin, and find themselves discovering Martin’s claims may be closer to reality than they thought. This is a nice lighthearted episode, even up to its bittersweet finale. –So Martin actually was from another world, which had been decimated by the Goa’uld, and he had come with the other aliens as deserters from that war. Martin would return two more times in the series, both during very numerically important & meta episodes (the first of which is next season). –As to “Peter Tanner” and the other aliens that came with Martin, see next season for their return. –Teal’c really enjoys vibrating hotel beds. –Fun sequence at the beginning with Hammond having to skip through Martin’s phone message a few times to get to the pivotal info that fuels this episode. 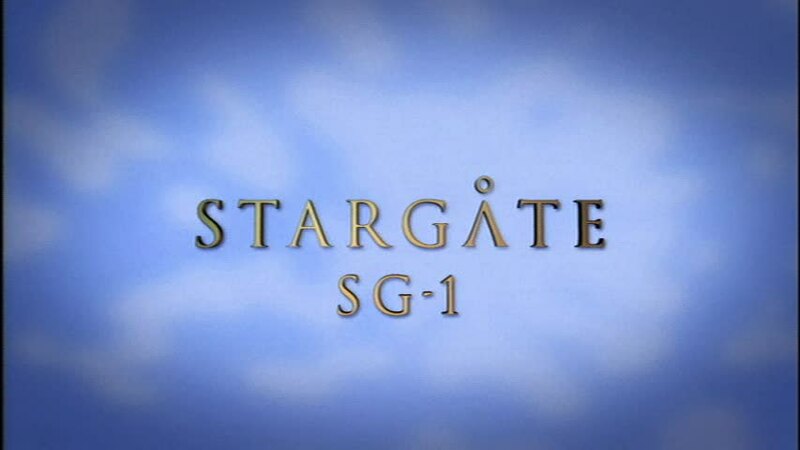 –Martin: “A top secret government program involving instantaneous travel to other solar systems by means of a device known as a Stargate.” O’Neill: “Sounds like a good idea for a TV show. If you’re into that sort of thing.” You have NO idea what you just started there, Jack. 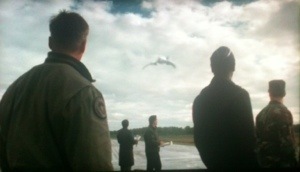 Teal’c and O’Neill are running a test flight of a military modified Goa’uld glider when things go awry. Apophis sabotaged that glider to leave its clearly non-Apophis loving occupants adrift in space, with no way to get back home. While our crew on the glider struggle to stay alive, Carter and Daniel enlist the help of Jacob to retrieve their teammates before they run out of air. So it’s a tense race against time episode to round of the minicaps today. –Weird connections: Peter DeLuise (frequent director on the show) knows Stephen Williams, the General in this episode, as his captain on the show he starred in, 21 Jump Street. –So that was a fun and complicated visual effects sequence which makes up the climax, which is O’Neill and Teal’c ejecting from the glider, using the ring transporter on the scout ship to beam them out of space before they die. –Before you think the military glider operation was a complete waste of time, we’ll get another, more successful version of this project down the road. –I like the fact that we get a time delay between the conversation between SGC and the adrift glider, accounting that communications through space wouldn’t be instantaneous. NEXT TIME: Daniel investigates a death connected to an Egyptian artifact in “The Curse”, SG-1’s attempt to sabotage a dangerous alliance between two System Lords is a literal minefield of trouble in “The Serpent’s Venom”, General Hammond’s retirement in met with suspicion in “Chain Reaction”, and a future Carter must send a warning to the past about an alliance with an alien race in “2010”.